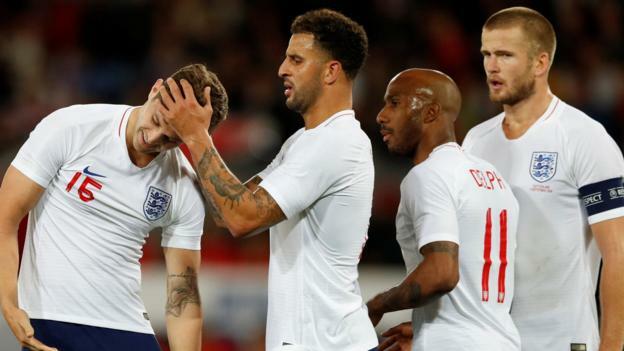 England’s first-half performance in the friendly win over Switzerland was “embarrassing” and the players “weren’t happy with how we were playing”, says full-back Danny Rose. The Three Lions struggled early on, but emerged 1-0 winners in Leicester. Striker Marcus Rashford scored the winning goal in the second half, converting from Kyle Walker’s cross. “We could have been two or three-nil down at half-time,” Tottenham’s Rose told BBC Radio 5 live. Gareth Southgate’s side were looking to avoid a record fourth straight defeat after losing against Croatia in the World Cup semi-finals, Belgium in the third/fourth-place play-off and in Saturday’s Nations League opener against Spain. The Swiss had 65% possession in the opening period at the King Power Stadium, with Liverpool’s Xherdan Shaqiri striking the post. Stoke goalkeeper Jack Butland – in for Jordan Pickford – looked particularly jittery with the ball at his feet and almost passed the ball straight into his own net. “It’s great we can all shout at each other and tell each other to improve like we did,” he said. “In the end, we are over the moon to keep a clean sheet and get back to winning ways. “The morale we have set within the squad is fantastic and we have taken off where we left off in the summer. Southgate told 5 live: “The players certainly had a lot to say to each other when they first got into the dressing room. “It was important then that we solved a couple of the problems they were facing and kept things calm. A combination of the two meant we got a good response in the second half. Have the last two international games altered your opinion on who should start for England going forward?